Records from the Victorian era show 14 named premises, with some wonderful names. Amongst them were the Sun, and the Moon, but no Stars... This account describes their location, and brief family histories of those who lived there. It took far longer than I anticipated to complete. Originally, I had intended it to be a simple list of documented sources of licensees, with a brief description of the premises, and an outline of the means by which the respective licences changed hands. I knew of two cases already, following discussion with fellow researchers of a licence being transferred within the family, but further examples arose during my investigation, demonstrating that whilst it certainly wasn't the rule, neither was it the exception. A very clear example where it didn't matter as much what you knew, as who you knew! Some of this was possible using our own transcriptions of Eyam and Stoney Middleton Census, and Memorial Inscriptions, but credit must also be given to parish register CDs provided by Valerie Neal, Family Search (the IGI), Ancestry UK, and FreeBMD sources, all of which proved invaluable in tracing family connections; and for added spice, past issues of The London Gazette, without which such an interesting tale could not be told. Special thanks also to Janet Kirk, Glenn Trezza and Tony Mason, for their generous and unstinting contributions, and for the stimulus they've provided for further research; to Clive Allen for the Thornhill references from Chapel en le Frith all those years ago; to Brian Austin for local newspaper snippets; and to Ann Andrews for spotting that first “bankruptcy” reference in the London Gazette! Situated on the south side of the junction of Stoney Middleton Dale and Eyam Dale, this old postcard shows the Ball Inn facing towards The Dale; other postcards showing a wider area indicate there was another building on the corner almost at right angles to it, whilst the road junction itself (to the left and outside the picture) was a grassy triangle, rather than the more functional T-junction we are familiar with today. Volume VI of the Derbyshire Archaeological Journal (1884, pp.109-156) has an account by Richard Keene of A Six Days' Ramble over Derbyshire Hills and Dales, in the Year 1858. Of Stoney Middleton, he remarks that the scenery of Middleton Dale is very bold and striking; on the right, huge masses of rock of fantastic shapes tower over the winding road.... In contrast, the other side is not so abrupt, but rises with a steep ascent to a greater height, covered with scanty herbage and numberless wild flowers... we had promised ourselves several nice pictures here, including the bold rock at the rear of the “Golden Ball”, an old-fashioned wayside inn at the junction of Eyam Dale, but the smoke beat us. The smoke was of course from the lime kilns, which (he says) appeared to be of one mind, and smoked away like Dutchmen during our whole time in the Dale. Thus we might imagine the setting of his Golden Ball, its sign lit up at night, shining through a cloud of smoke, to welcome the weary traveller - though whether it was ever so is unknown. In official sources at least, it is always recorded as simply The Ball. Its first recorded landlord (in Pigot's, 1821-2) was George Bradshaw, but it seems probable he was keeping the Inn a few years before that, as he is recorded as a Victualler in 1815 in a list of Eyam - Licensed Victuallers 1810-1821. George died on 15 May 1851 aged 73, and is buried at Eyam. [q.v. 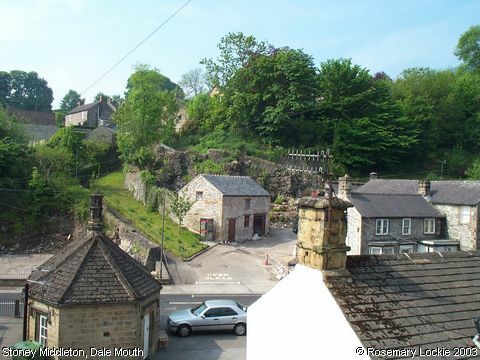 #E120, Eyam MIs] He was succeeded as licensee by his wife Mary, who died 15 Apr 1865, aged 80. As can be seen from their ages on the 1851 census she was younger than he was, but it's still a grand old age to stay “in harness”! A Mary A Hallam appeared briefly as its licensee on the 1871 Census, and an 1872 directory records a George Hallam as licensee; it seems probable he was the Bradshaw's great grandson George Hallam, living with them in 1861, and that Mary Ann was his wife, but this has yet to be fully investigated. Joseph Robinson, its licensee in 1881 was a Lead Miner in Wardlow in 1871. There does not appear to be any connection between him and the Bradshaws, or indeed subsequent landlords. Following his widow Sarah, came Joseph Outram. He was probably living at the Royal Oak in Eyam in 1891 with his mother and stepfather Samuel Turner. He married Emily Leech at Eyam in 1903, and when he died in 1947 was buried at Eyam, although by then he was resident at “Swallownest” - possibly the cottage in Grindleford of this name. There's an intriguing connection between Samuel Turner and the earlier-mentioned George Hallam to be found in the 1871 Census in Brightside Bierlow in Sheffield, but I'll leave it for interested parties to determine its significance, if any to the handing on of the licence! Nothing is known about Richard Frith, the licensee recorded in Kelly's Directory of 1912, but it is possible he was the Ball's last landlord. The pub licence is known to have been transferred to the Royal Oak at Eyam sometime in the early 20th century, and its buildings are now in ruins. The ‘Castle Rock’ itself, so prominent on this postcard, is now hidden by trees, and incidentally, appears to have nothing whatsoever to do with the former Castle Inn. I would guess the name owes its origins to the Victorians rather than to antiquity, given their penchant to apply ‘romantic’ names to scenery. A George Hallam, gt-grandson aged 15, a Lead Miner b.Eyam is included in the household. Whilst it is not known where The Barrel was situated, it was probably at the ‘Town’ End rather than in Middleton Dale. Its last known landlord was Philemon Swift Marshall (Pigot's, 1835), who by 1841 was recorded on the Census of Stoney Middleton as a Farmer, then in 1851 as “Bookkeeper to Barytes Manufacturer and General Labourer”. He was also the Census Enumerator that year, and had a clear and legible hand, so he was obviously well-educated, as possibly of necessity were all publicans! George Marshall was first recorded publican at The Barrel in Pigots's 1821-2 directory. See also Eyam - Licensed Victuallers 1810-1821, where Philemon Swift Marshall was recorded as a publican in 1819; presumably the landlord of a pub in Eyam at that time. Beerhouses and Beersellers were possibly more commonplace than the two I've been able to identify. Beer was sold by Elizabeth Swift in 1841, a widow, previously married to John Swift who died in 1839, and who also may have been a beer seller. Apparently Elizabeth was remarried by 1851, to John Goodwin, a lead miner - their household is identifiable by her sons Thomas Swift (26) and Philemon Swift (19) living with them. A beerhouse is also recorded under ‘Shopkeepers’ in Sheffield and 20 miles thereabouts, 1862, where mine host was Henry Goddard. As it happens, John and Elizabeth Swift were Henry's maternal uncle and aunt; however no record of either a Beerhouse or Beer Seller has been found in intervening years, so it is not known whether this is significant, especially - perhaps - as Henry wasn't to carry on in business for very long. Past issues of the London Gazette reveal that Henry Goddard, a Grocer and Beerhouse Keeper, was adjudged bankrupt under a petition filed at the County Court in Bakewell on 7th September, 1863, and was “hereby required to surrender himself to the first meeting of creditors” to be held on 22nd September, at twelve noon “precisely”. William John Neale, of Matlock, was the Solicitor acting in the bankruptcy, and Thomas Hinch, of Stoney Middleton, was the Trade Assignee. This entry was of special significance to me as Henry Goddard was my (Rosemary's) gt*2 grandfather. Thomas Hinch would have been my sometimes-great uncle. The Boot and Shoe was sited at the west corner of The Bank with Stoney Middleton Dale, and is marked on the Plan of Stoney Middleton Bank of 1840 showing the proposed route of the new road through The Dale. 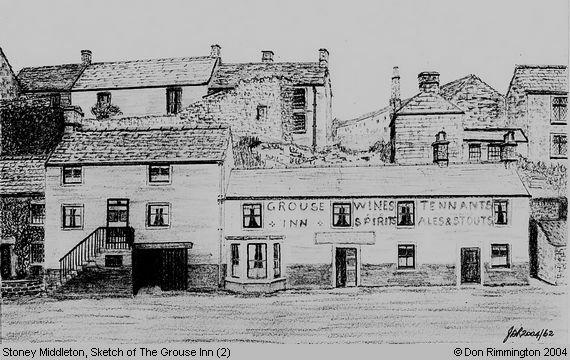 It later became known as The Grouse; however the building it occupied is now a private house. Obviously a tough life! Prior to that however all seemed to be well. William had inherited the business from his father, also William Wild, when he died in 1838 - he stated in his Will that his son William Wild was to have “the possession of all that Cottage-hold Public House known by the Sign of ‘the Boot and Shoe’”, as well as some portions of land, and another cottage. Then four years later, the following account appeared in the Derby and Chesterfield Reporter of 14th July 1842 (a Thursday) indicated business was still booming! The members of The Women's Club, which is held at Mr William Wild's “Boot & Shoe”, Stoney Middleton met on Wednesday, and attended by the Eyam Band proceeded to Middleton Church where a sermon was preached by Rev Mr Smith. The Party then returned to the Club House (the Boot & Shoe) and partook an excellent dinner prepared in a manner reflecting great credit upon Mrs Wild, the Landlady. William Wild (b.1802) and his wife Hannah née Cundey (to whom credit was due for the ‘excellent dinner’!) were my (Rosemary's) gt*3 grandparents. Their daughter Elizabeth was to marry Robert Hancock, who was a later licensee of The Grouse. William's sister Susanna Wild (b.1794) married William Townsend in 1812. [ex Glenn Trezza] William, who died young, in 1845 was a coachman [ex Glenn Trezza], and son of Joshua Townsend and Mary, widow of John Hallam, a licensee of the Stag's Head Inn. There is no mention of the Boot & Shoe in Pigot 1821-2 or Glover 1829. In the latter a William Wilde was a shopkeeper and shoemaker, but this is not necessarily either of the Williams mentioned above. We were uncertain originally where the Bull's Head was located. Various Census entries indicated it lay in Middleton Dale (the Eyam side) somewhere between the Lover's Leap and Grouse, as for example, in Eyam - East of the Church, 1901, it was 2 households down from the Lover's Leap, and 7 “doors” up from the Grouse. More recently, however, an Old Postcard, featuring the Inn has come to light, showing it in situ, for which see the article Found - The Long Lost Bulls Head Hotel (as it is called on the postcard), on the Stoney Middleton Heritage website. Edmund died on 3 Sep 1848 aged 45, with his death being recorded on a family memorial at Eyam. As noted previously, Sarah was remained at the Bull's Head in 1851, but in 1856 [q.v. IGI] she remarried Thomas Broomhead, a widower and publican from Calver. He appears briefly as licensee at The Bull at Stoney Middleton in Harrison & Harrop's directory in 1860, but by 1861 he had returned (with Sarah) to Calver, where in 1861 he was a Farmer of 40 acres. A succession of disparate landlords followed on from Thomas, to its last recorded in 1904, Mary Helliwell (presumably the widow of Thomas Helliwell, on the 1901 Census. So far no connection has been discovered between them. Kelly 1891 Ernest Coupe Commercial Bull's Head P.H. ‘The Castle’ was opposite the Church, and reputedly so-called because of its castellated wall. However might it not have been the other way around with the castellation being symbolic of its siting nearby the old “Castle Hill” - “an elevated oval-shaped eminence on the bank at Stoney Middleton” as described in A History of Stoney Middleton (Ch.8) ? No entries have been identified in Directories or Census. Known to be ‘The Denman Arms’ for a few years only (1840-1848), afterwards it was the Sun Inn, kept by the same landlord, John Lancake. The Grouse was sited on the corner of The Bank with The Dale, and opposite The Dale Mouth, and Royal Oak. It was known previously as the Boot and Shoe Inn, being last recorded in that name in 1846. The first known landlord of The Grouse was Robert Cocker, listed in a 1848 Post Office Directory. Perhaps the change of name was a consequence of its previous landlord William Wild's bankruptcy, in 1846! The experience does not however seem to have prevented him from trying again, since he went on to become a Publican & Gamekeeper, resident at the Derwentwater Arms in Calver as seen on the 1881 Census of Calver. Neither does it appear to have deterred subsequent licensees from trying again back in Stoney Middleton, and indeed it has been one of the longest surviving pubs! The Grouse's next recorded landlord, in 1851 was Joseph Wyatt, followed by George Barker recorded in 1857 (White's) and 1860 (Harrison & Harrop). Joseph Wyatt appears to have married a Margaret White at Bakewell in 1822. [q.v. IGI] By 1851 sadly, Margaret was recorded on the Census as blind. I have not been able to discover anything further about either him, or George Barker. My gt*2 grandfather Robert Hancock was landlord between the 1861 and 1871 Census. He was also a butcher, as was Joseph Wyatt; perhaps they needed a second profession to keep them going! However by 1881 Robert had moved back into Stoney Middleton ‘Town’, where he was a farmer, and in 1891 he was living up the High Street. George Marsden, the landlord in 1881 also continued in his profession noted on earlier Census of saw-handle maker. A succession of landlords followed him, occasionally also carrying on with another profession, as for instance Joseph Blackwell, also a boot finisher, until the last recorded in 1932, Thomas Lowth. Kelly 1891 John Collingham Commercial Grouse P.H. Kelly 1895 Joseph Blackwell Commercial Grouse P.H. Mentioned only in “Stoney Middleton - A Working Village”  as being in The Nook. Nothing further is known; but perhaps it was associated with the public house on the former site of The Moon Inn. 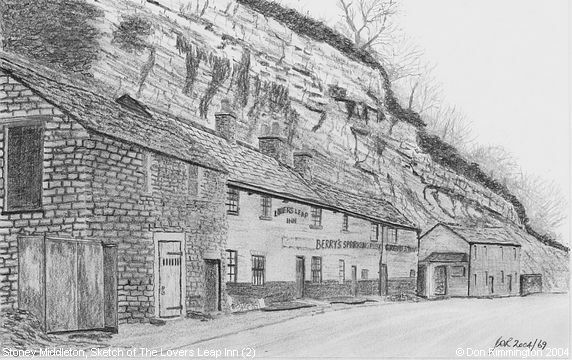 The premises where the pub used to be is now the Lover's Leap Café. The story of how the name of its surroundings arose has been told by amongst others, William Wood, in his Tales and Traditions of The High Peak - The Lover's Leap. Landlords include my (Rosemary's) maternal grandfather George Henry Reeves. Hannah Baddaley - the Lady who Leapt - was the daughter of William Baddaley and his wife Joan née Townsend. She was baptised 22 Feb 1738/9 and buried 12 Dec 1764. Her father William died in 1758, and mother Joan in 1766, and they were survived by just one grandchild - Joan's Will leaves everything to her. It is not known how long licensed premises occupied the site. 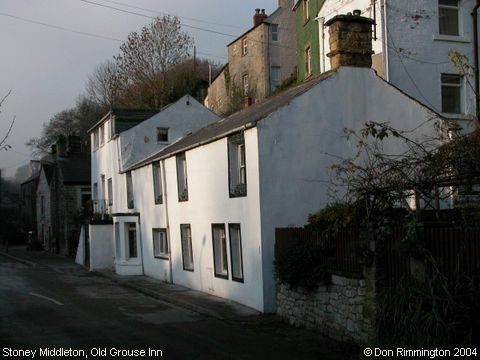 Its first documented landlord (Pigot's 1821-2) was William Clayton (Janet's gt*3 grandfather); this was also the first year he was recorded as a licensee in Eyam - Licensed Victuallers 1821-27. William was baptised at Peak Forest (14 Nov 1784), so in 1821 he would then have been about 37; his father Robert is also known to have been a publican, at the Pack Horse Inn at Peak Forest. William's first known occupation was as a carrier; perhaps he stopped off one day on his way through Stoney Middleton for a little light refreshment at the pub; the landlord's job was on offer, so he took it! However when he died on 26 Dec 1849 [q.v. his Will, the licence passed to his son in law Samuel Mason. Samuel had married William's daughter Grace Clayton in 1826, and as we saw earlier, Samuel's sister Sarah Mason was later to marry Edmund Cocker, who kept the Bull's Head. Samuel Mason died in 1864, with his Will recording that the Lover's Leap premises were to be sold by auction. However that doesn't seem to have prevented the premises staying in the family, since the licence then passed to Samuel's son in law Joseph Morton who had married Samuel's daughter Hannah! According to recorded evidence Hannah remained landlady until the pub was taken by my grandfather George Henry Reeves in about 1898. He didn't stay there long, because (it is said) he drank too much of the profits, and they left sometime before the birth of my aunt Alice in December 1902. The next recorded landlord was George Mycock, in 1904, last recorded there in 1912. Hannah Morton died sometime between the 1901 census and 1908, when her sister Clara's Will was proved, so perhaps her death is the one registered in Sep 1/4 1906 aged 79.
Who was George Mycock? The 1901 census records one candidate aged 57 b. Hazel Grove in Cheshire; although it could feasibly have been his son George, aged 23 in 1901 we understand he was in partnership in the bootmaking business with his cousin Allen Hinch. George senior had married Ada Hinch. [Dec 1/4 1874 - FreeBMD] Allen was the son of Ada's sister Florence Hinch; they were daughters of the ubiquitous Thomas Hinch (c1806-1870) and his 2nd wife Sarah née Mason. Sarah was the daughter of Samuel Mason and Grace née Clayton, which is where we came in! She died 24 Nov 1858 aged 30, [q.v. #B031, Stoney Middleton MIs] and Thomas then married for a 3rd time in 1859 to Sarah Vanes at Chesterfield. Oh, I almost forgot to close the loop - Thomas Hinch's first wife was Mary Clayton, who died in 1843 aged 35. Was she related to William Clayton? I'll leave it to you, dear reader to work that one out! Kelly 1895 Hannah Morton (Mrs) Commercial Lover's Leap P.H. The Miner's Arms is marked on the Plan of Stoney Middleton Bank of 1840, on the left side entering the Nook, and opposite the site of the ‘old’ Moon Inn. It would appear from the plan to be the 3-story building facing us on the left of the accompanying photograph; however we've reached the conclusion that either our deductions from the map are incorrect, or like The Moon it moved to new premises following the new road being built. Whilst census enumeration order is notoriously untrustworthy, Janet spotted the Miners was enumerated 2 schedules away from the Royal Oak on one of the Census, which didn't make a lot of sense from their relative positions on the Plan. In addition, Thomas Cowen's History of Stoney Middleton describes the Miners as “near the present police station”. Whilst the police station itself is long gone, we are reliably informed that the premises it occupied was a few doors up the Dale from the Grouse, on the right side going towards Eyam - a 'double-fronted' building, now a private house, which still has ‘jail cells’ in its basement! If the Miners in Thomas Cowen's day was nearby, it could have been on the opposite side of the road making it indeed just a few doors up from the Royal Oak, and as it says in the newspaper announcement of its sale below, in 1832, in Middleton Dale. Its first recorded landlord was Jonathan Cocker (Pigot's 1821-2), with another Jonathan Cocker aged 30 being recorded as a Publican in 1841 - not the same one obviously, but we believe it may have been his son, baptised in 1811. Prior to that the name Jonathan Cocker first appeared in the list of Stoney Middleton - Licensed Victuallers 1777-1809 in 1792, with possibly 3 generations of Cockers holding the licence, and the potential to be grandfather, father and son. Freehold Public House and Gardens - To be Sold by Auction - by Mr Saunders. 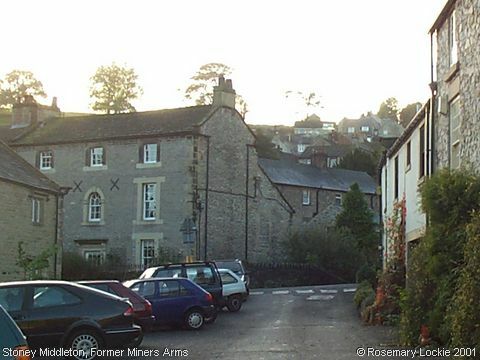 On Thursday 16 February 1832 at 6 o'clock in evening at the house of Mrs Cocker, the Miners Arms in Middleton Dale - lately in the possession of Jonathan Cocker (deceased) and now in the occupation of his widow as Tenant. It would appear therefore that what is assumed to be their son Jonathan was able to buy it back, or perhaps to continue for a few more years as sitting tenant, as he was recorded there on the 1841 Census. However by 1851 he was was living in Stoney Middleton Dale (Eyam Side), occupied as a Carter, and likewise in 1861 and 1871. As he doesn't appear in the 1881 Census, it seems likely he was dead by then, although no death registration has been found. Meanwhile at the Miners, the next landlord to make an appearance (in a Post Office Directory of 1848) was a William Jackson. He is perhaps the one who appears on the 1851 Stoney Middleton Census as a Broom Maker, born c.1814 in Fletching, and one of the several broom-making families who came to Stoney Middleton from the county of Sussex. He died in 1861 aged 47 [q.v. #B019, Stoney Middleton MIs] having married in 1838 [q.v. IGI] at Hathersage, Elizabeth Broomhead. William was followed by George Shaw in 1851, another “foreigner” from Glapwell, then Joseph Pursglove shortly after. The pub appears to have closed some time after 1871, as its name no longer appears along with the regulars in subsequent directories, and its landlord in 1871, Hugh Scivell had become a Hawker & General Dealer again by 1881. He was born in Ireland but had arrived in Eyam by 1851 as a Hawker of Hardware, living on Middleton Bank, recorded as Hugh Savill on the return - although in subsequent years - in both Census and Directories - he appears consistently as “Scivell”. When it first opened in the High Street it was known as ‘The New Moon’ until the ‘New’ was eventually dropped. Its first landlord was William Moseley, and (according to Cowen's History of Stoney Middleton) at one time it was also kept by George Booth, who later went on to farm at Highfield. The ‘Old’ Moon Inn was once the scene of a brutal murder. During the eighteenth century, a travelling salesman from Scotland (the “Scotch Pedlar”) came to the Eyam Wakes during August, to sell his wares. The story is told that he reported another group of Pedlars for illegal trading, and by way of revenge, they murdered him in one of the outbuildings of the Inn. The Landlord is said to have turned a blind eye (bad for business?) when they carted the body away on horseback to throw it in Carlswark Cavern, in Middleton Dale. It was discovered 20 years later and identified by the distinctive buckles on the shoes, which someone had remembered the Pedlar wearing. A bell ringer named Matthew Hall is said to have made off with the buckles, whilst the bones were buried in Eyam churchyard. As we have yet to identify Joseph and Hannah from amongst the Stoney Middleton Thornhills, another possibility is that they were the couple who were Innkeepers at Hayfield, who are recorded amongst Clive's citations. This Joseph Thornhill died just a few years earlier, in 1825 aged 69, which fits rather conveniently with his disappearance from Stoney Middleton, whilst Hannah (“wife of Joseph Thornhill”) died in 1844 aged 85. It would be nice to find a better reason for this though, for a relocation! William Moseley's first documented appearance in directories was in 1835 (Pigot's). The next we hear of him is 1841, when on Census night he was recorded as Innkeeper, with 7 servants! The move to new premises must have been accompanied by a greater prosperity, but perhaps there were all the “navvies” to cater for, working on building the bypass! Other pubs tended to have 1 or 2 at most. There was also a Thomas Moseley in the household aged 40, described as a Publican, and 2 younger Moseleys. A Post Office directory shows him still an Innkeeper in 1848, but by 1851 the Moon had been taken over by Robert Heginbotham. What happened to William after that isn't clear, but apparently he lived to be aged 93, according to his MI! [q.v. #B051, Stoney Middleton MIs] He had married Catharine Morton in 1798 [q.v. IGI]; she had predeceased him, dying in 1840 aged 67. Meanwhile back in 1851, there was to be another connection with Chapel en le Frith. Robert Heginbotham, its landlord, was born in Chapel en le Frith in 1812 [ex Janet Kirk], believed to be the son of John Heginbotham and Olive, née Lomas. He was to marry Ann (Nancy) Cundey, in 1836, and he was named as one of the executors in Ann's father John Cundey's Will. And there was yet more trouble at t'Mill to come following Robert Heginbotham's death. An announcement in the London Gazette on 22 May1866, revealed a dispute between Nancy Heginbotham (plaintiff), and John Heginbotham and others (defendants), in claiming against “the estate of Robert Heginbotham, late of Stoney Middleton, Innkeeper, who died on or about September, 1864”... John Heginbotham was possibly Robert's brother; he was living in the Nook in Stoney Middleton in 1871, and described as Barytes Manufacturer Master, employing 3 men. The Tricketts, Hugh, followed by his widow, Elizabeth, were to occupy the pub for the next 30 years or so until it was taken over by George Hancock about 1895. Hugh apparently died in 1890, with a death registration for Hugh Trickett being recorded at Bakewell in Mar 1/4 that year. When Elizabeth died is unknown, but she was still in Stoney Middleton in 1901, living with Gascoine grandchildren. Elizabeth had been previously married to another Innkeeper, William Gascoyne, of Hassop. He died 12 Nov 1875, and there was a notice in the London Gazette dated 20 Feb 20 1877 for creditors to submit claims on his estate. It also stated that Elizabeth was sole executrix of his Will, and was (then) wife of Hugh Trickett, of Stoney Middleton, Innkeeper. George Hancock, who took over some time between 1891 and 1895 was a nephew of Robert Hancock, formerly the landlord of The Grouse. George is also remembered as landlord at the Bull's Head at Eyam, but we have no recorded evidence of this. He died in 1926 [q.v. #E074, Stoney Middleton MIs], following which the pub was (presumably) taken over by the landlord recorded in Kelly's 1932, Ben Launder. The Royal Oak was situated on the west corner of the junction of The Dale and The Dale Mouth, and was a licensed public house until recently. However, it has now been converted to residential dwellings, with the complex now known as “The Old Oak”. The main premises can be seen behind and to the right of the chimney on the accompanying photograph. The Royal Oak is fabled as one of the stopping places for the couple known as ‘Allan and Clara’, who in 1748 (or 1758 in some versions of the tale) were on their way to Peak Forest - the Derbyshire equivalent of ‘Gretna Green’ - to get married. They were however murdered by some miners in the Winnats Pass near Castleton for their possessions. Their tale would have perhaps remained untold, but one of their murderers is said to have confessed to the Vicar of Castleton on his death-bed to the deed. The saddle belonging to the horse that Clara was riding is said to have been kept at the Royal Oak for many years. It is now to be found on show in the Peak Cavern Museum at Castleton. Jeremiah senior was born possibly about 1730, place unknown, but perhaps the Jeremiah Serle recorded in the IGI in 1726 at Downe St. Mary, Devon. His burial is recorded in 1792, when the parish register entry described him as “parish of Bakewell” (which may have meant Calver). William (b.Norton), and his sisters Grace (b.1788) and Ann (b.1790) both b. Stoney Middleton have been traced on the 1851 Census in Sheffield and Norton respectively, thus confirming it was the same family, with their time at Norton (presumably) coinciding with one of the breaks in the record of licensees in Stoney Middleton. It isn't clear who was licensee of the Royal Oak in 1841; all those recorded as publicans or innkeepers are accounted for, but it seems probable it was Jonathan Hallam. His name appeared for the first time at the Royal Oak in 1848, whereas (apparently) in 1841 he had no occupation (the column was left blank); however his wife was recorded as “Husband Man”! He was the youngest son of John Hallam (1775-1844) and his wife Ann Hall, and a brother of John Hallam who kept the Stag's Head; and like Philemon Swift Marshall, doubled as a census enumerator. For some reason there is no record of Royal Oak on the 1871 Census. The only unaccounted-for publican for the period I have amongst my records is Joseph Goddard (the brother of John, who kept the Miners Arms) who is known to have been a publican living in Stoney Middleton in 1876, when his son Albert Thomas was born - although baptisms of other children in 1871 and 1874 record him as a Miner and Shopkeeper. The last recorded licensees of the Royal Oak for the period under study were Robert and Ann JERRAM, who between them served for about 30 years. Formerly known as Stag's Horns (1821-2, Pigot) and Stag & Horns (1829, Glover), the Inn is first recorded as the Stag's Head in 1835. The main A623 Trunk road now passes through the original site of the premises, which were demolished to make way for the new road to be built through the Dale in 1840. This original site can be seen on the before-mentioned Plan of Stoney Middleton Bank of 1840. As with many of Stoney Middleton's Inns, it was also a coaching inn, and a very convenient one too, as it would be the first premises coaches arriving from the Chesterfield direction would have seen on entering the village. ‘Straight ahead’ - where the road goes now, wasn't an option prior to the ‘bypass’. It was either turn left up the High Street or right down The Nook, and over The Bank. 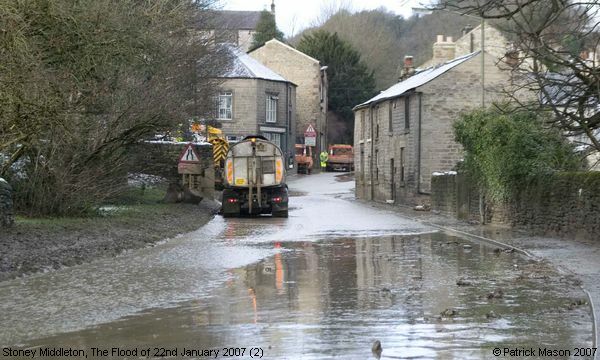 The former site of the Stag's Head would have been in the gap between the two rows of houses, where the orange truck is parked on the photograph. When it was demolished to make way for the new road, the licensed premises moved to what is now a private residence - ‘Stag House’ - situated in one of the steepest parts of the High Street. When she died in 1831 the licence might logically be assumed to have passed to her son John Hallam (Glenn's gt*4 grandfather, 1775-1844), but there is no evidence of that, as we have no record of his being other than a farmer, and possibly owner of the premises. The Hallams were compensated handsomely for the former Stag's Head being pulled down, as an account records that Mr. John Hallam Senr was paid £300 “for the Stag public house”, and Mr. John Hallam Junr “for the inconvenience of being deprived of the Tenancy of the Stag Inn” £20. Thus it seems probable that Mary's son John owned the premises, whilst his son John Hallam (1805-1885), was the licensee. He is last recorded as a publican on the Census in 1871, and in directories in 1872. In 1881 one of his sons Frederick Stockdale Hallam was landlord, followed by another son Peter John Hallam in 1891. Peter was succeeded by his widow Mary Hallam who had been previously married to Joseph Hancock (1830-1878) brother of Robert Hancock, who had kept The Grouse in 1861 and 1871. Joseph's son George (1857-1926) has been mentioned previously as landlord of The Moon Inn. The last known reference to The Stag's Head is 1912 (Kelly), so perhaps it closed when Mary Hallam died in 1924 (aged 86) as it isn't listed in Kelly's directory of 1932. It would therefore appear to have been in the property shown on the photograph, with the rounded walls, although the rounding is believed to have taken place at a later date. Unless of course that is how it became known as “The Sun”... Alternatively, Thomas Cowen's History of Stoney Middleton (Ch.10) describes it (in 1910) as being “opposite Verandah Cottage”... which suggests perhaps further down the block, away from us on the photograph towards Calver. Cowen, in his History of Stoney Middleton says John was also a silk weaver. 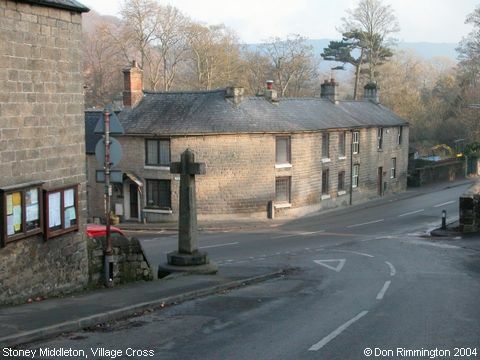 John does not appear to have had any previous connection with Stoney Middleton prior to his appearance there, nor does his wife Ellen, and incidentally, there is no known relationship between her and Robert Heginbotham from Chapel en le Frith. Amazingly too for a surname having possibly more spelling variants than ‘Baggaley’(!) their respective surnames were spelled almost consistently as ‘Heginbotham’ and 'Higginbotham' in the records. Ellen was baptised at Eyam in 1779, the daughter of Thomas Higginbotham and Ann née Elliot, who were married at Dronfield in 1762. [ex Phillimore] They lived at Goatscliffe, where Ellen's brother (another) Robert Higginbotham survived to be recorded on the 1851 Census. Finally, to conclude this account, on 18 Sep 1840 the London Gazette reported that Samuel Unwin, of Eyam, Byratis [Barytes] Powder Manufacturer, “hath conveyed and assigned all his estate and effects whatsoever to Matthew Frost, of Calver, Barmaster, John Lancake, of Stoney Middleton, Publican, and William Clayton, of Eyam Publican, as trustees, for the benefit of all the creditors of him the said Samuel Unwin”. Nice to end with a note of a “trusty” publican (or two)! 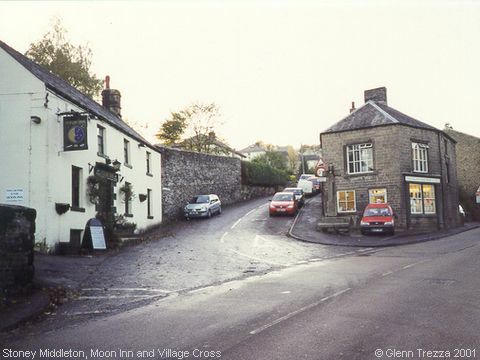 Stoney Middleton - A Working Village, 2002. A ‘Millennium Awards’ publication, possibly still available for sale in the village. Thornhill, Robert - Notes on Some Derbyshire Toll Houses and Turnpike Roads. Derbyshire Miscellany. 4, (1968) pp.185-216 - ex Brian Austin. Cowen, Thomas - A History of Stoney Middleton, 1910. A transcription of this booklet will be available online shortly. Information compiled by Rosemary Lockie with the assistance of others, 2003-2007.